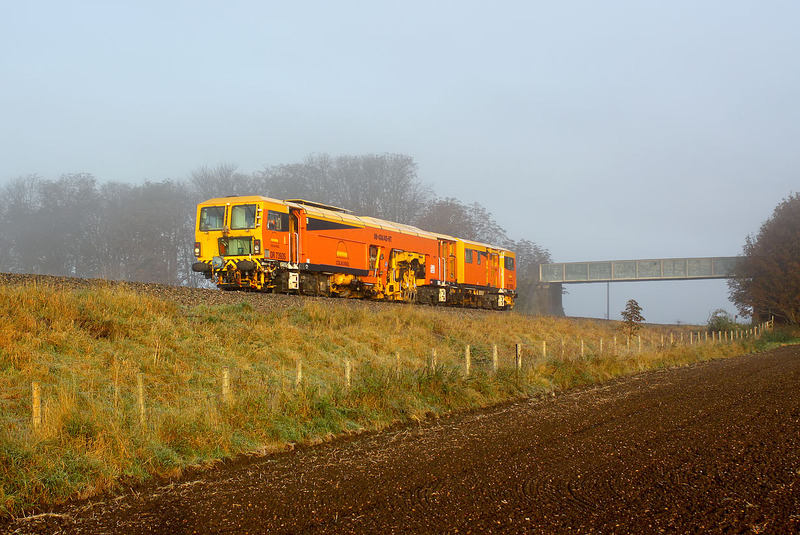 Colas Rail Plasser & Theurer 08-4x4/4S-RT Switch & Crossing Tamper DR73935 passes Cholsey on the foggy morning of Sunday 14 October 2012. I had gone to this location for 60059 on the 6A70 08:32 Didcot to Colnbrook tanks, but after the sun initially started to come out, the fog then rolled back in, and by the time 60059 passed it was so thick that the bridge was no longer visible! Therefore this colourful tamper in the very weak early morning sun is some slight compensation for my early morning walk!